There are a lot of types of separation, and as I’ve discovered, parting is “sweet sorrow” only sometimes. We are gearing up to depart Vermont, where the Airstream and our daughter have been parked all summer long. That means the usual five-day process of catching up on everything before we head out. It’s not that re-packing the Airstream is all that hard. In fact, it’s quite easy. What makes the job hard is re-organizing, cleaning, culling, and making decisions. Imagine that every six months you took everything out of your house, decided what to donate or toss, and then put it all back. Don’t forget every scrap of clothing you have, and add in a growing 10-year-old with a wardrobe, and you’ll start to get the picture. We’ve got t-shirts and plastic forks left over from Alumapalooza, dust from Ohio, spider webs from Vermont, and receipts from the NY State Thruway. You can ignore this gradual accumulation of junk in your house because it’s so much bigger, but in 240 square feet any bad habits of housekeeping quickly catch up with you. Then there’s the detritus of three months of courtesy parking. Emma’s stuff is spread all over an acre of property. The solar panels are covered in tree mulch and bird droppings. There are the unfinished projects to sort out, shopping to do, tires to re-inflate, things that need lubrication and things that need cleaning. And while we are doing this, there are the friends who want “one last visit” before we go, who we sometimes (regretfully) have to say “Sorry” to because we need every spare moment to get all of our projects done. One project in particular that is vexing me (I’ve never spoken of myself as being vexed before but that’s how it feels) is removal of the old Tour of America decals. Officially the Tour of America ended in October 2008 when we ceased full-time travel, but we left the decals in place (a) because we like them; (b) it looked like a difficult and uncertain job to remove them. Indeed it has been. I decided to start with the most obviously out-of-date decal, the big purple Tour of America sign on the curbside. There were several questions: How do you get it off? Will it leave behind a shadow from differential sun fading? Will it damage the clearcoat? I did some online research but couldn’t find anyone who had removed decals from an Airstream before, so I took my best shot at it. It turns out that the vinyl peels up rather slowly and with considerable effort, if you use hair dryer to heat it up as you go. There was no damage to the clearcoat, and no fading or shadowing. But the decal left behind a nice sticky layer of adhesive that resisted most chemical attacks. I had to be careful when experimenting, as some chemicals might also remove the clearcoat. Goo-Gone was anemic, as was mineral spirits. The chemical M.E.K. did a pretty good job but the fumes were amazingly horrible. Goof-Off worked just as well and was less difficult to be around. Even the best treatments took 4-5 passes to completely remove the adhesive with a plastic scraper. At this point about 80% of the adhesive is removed. I’ve been at it for about an hour or two each day for three days — about as long as I can stand the fumes. Separating adhesive from clearcoated aluminum is a job I can live without. When time comes to remove the other decals, I may take it to a automotive vinyl graphics shop and pay to have professionals with respirators and bunny suits do it. But now that I’ve started this one, I have to finish it before we head out. Otherwise, our trailer side will effectively be a 4×5 foot piece of flypaper. We don’t plan for the trailer to go naked, however. What will go on the trailer instead? That’s a difficult question to answer. Right now Brad, Eleanor, and I are kicking around various designs and ideas. Here’s one that I really like, but which we won’t be using (mostly because I need to promote magazines, not this blog). No matter what we ultimately choose, I think you will still be able to easily identify us as we roll by. But it will be a few weeks before the final decision is made. We will have to live with whatever we choose, for quite a while. And I don’t want to have to remove decals again for a long time. It’s one form of separation that has no sweetness associated with it at all. 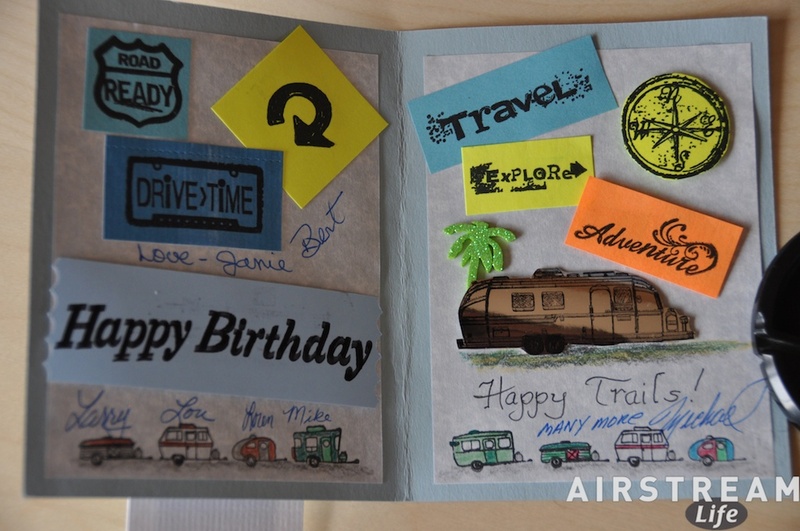 Good news for those who are only interested in Airstream travels … we will resume our Airstream explorations sometime next week, with a three month voyage down the east coast and then westward back toward Arizona. I have re-settled in Vermont, joining Eleanor and Emma in the Airstream, currently parked in my parents’ driveway along the shores of Lake Champlain. The Airstream seems to have survived its very wet summer fairly well, with only a dozen or so major spider webs strung along the wheels, hitch, and roof vents. It rarely sits in one place so long. I am sure there will be some maintenance items before we can head out again, but hopefully nothing worse than greasing the hitch and adding air to the tires. Likewise, the Mercedes has survived. You might think that was a no-brainer, but I was receiving regular reports that made me a little nervous. The car’s parking space is drastically humid, with daily bird overflights that result in frequent acidic attacks on the paint. But Eleanor has tried to clean up the messes promptly, and I will forgive her for letting Emma eat Cheez-Its in the back seat. The car had its 30,000 mile service last week, which shows how much we’ve been using it. It is only 16 months old. We’ll need a new set of tires, and possibly brakes, before we get back to home base in November. Coming from Arizona, where hot “summer” weather will continue well into October, to Vermont where summer is already winding down, is quite an adjustment. Everyone is grabbing the last moments of beautiful weather and outdoor activity here. 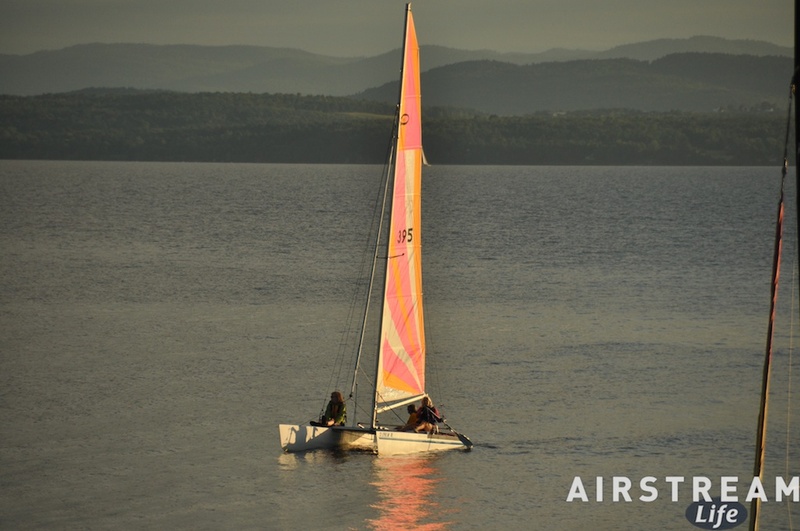 Last night a gang of friends showed up to race the Hobie Cats on the lake, but the wind was light and it turned into more of a leisurely sail. Eleanor and I invited our friends Guy & Katie to come over as well, and we watched the Hobies depart while we had grilled dinner on the deck. 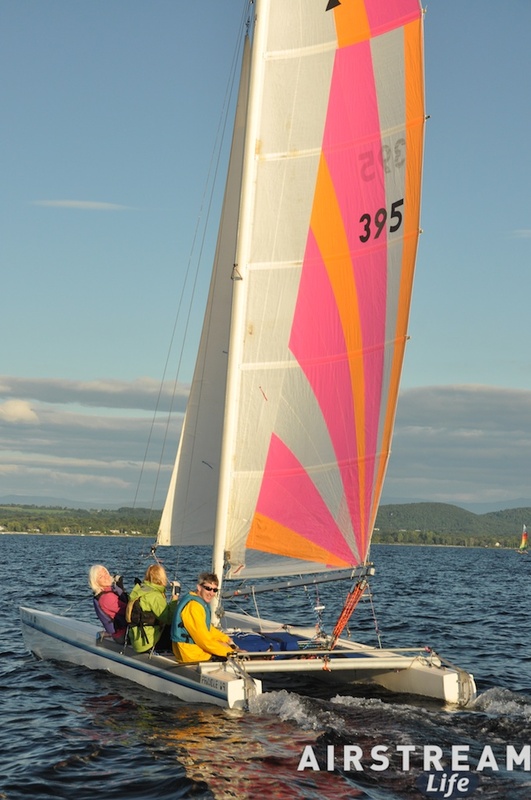 Due to their slow speeds, there was plenty of time to eat dinner and hop in the Boston Whaler to intercept them as they came back across the broad section of Lake Champlain (about 3 miles). 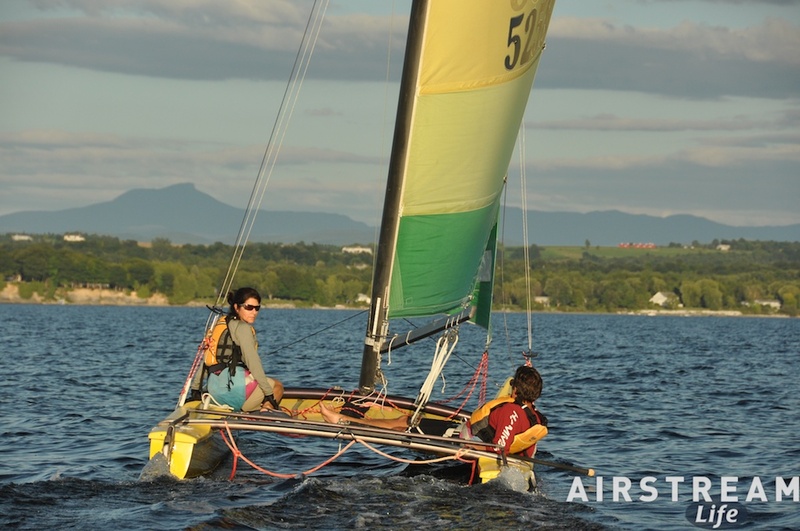 There wasn’t a lot of white-water action, but it was a good night to enjoy the blue-green view of Lake Champlain and the Green Mountains as the sun set. In the picture above, you can see Steve and Carolyn puttering along with the distinctive shape of Camel’s Hump in the background. Camel’s Hump is a regular summer climb most years, about 4,000 feet in elevation. There’s some wreckage from a WW II era plane crash near the summit, and spectacular views. I may see if I can recruit someone to do that hike this weekend. I hustled at work last week so that this week would be relatively easy. This is just past the peak of summer in Vermont, and in some ways it is the very best time of year. The bugs are signing out for the season, the humidity is gone, temperatures are in the 70s most days, thunderstorms are less frequent, the lake is perfect for any activity, and the sunset is still late enough for a quick boat ride after dinner. This is the season of county fairs and chicken suppers. There’s still fresh corn on the cob to be had, the gardens are still producing, and ripe apples are just around the corner. In late August, the frantic rush-rush of summer is over. Vermonters have done their bike rides, scenic walks, farmer’s markets, historic house tours, swimming, boating, fishing, and dinners out on the patio. Late summer comes with a feeling of satisfaction, if you’ve played it right. Anything after this point is bonus time. You can get becalmed on the lake at sunset, and it doesn’t seem like any big deal to have to paddle the last few hundred yards back to port. This is probably the last really quiet week we’ll have for a while. The travel plan calls for numerous stops in September and October. We’ll be on the move every few days. I can see half a dozen visits just between Cape Cod and New Jersey, and we’ve got about ten stops planned in Florida during October. This next week will be about getting mentally re-charged and prepared for an extended trip, and it looks like I’ve timed my return perfectly, because it looks like the perfect week to do it. While paused in Tucson as Temporary Bachelor Man, I recently had a birthday come and go with minimal associated excitement. This was the plan; we’d have a small party when I got back to Vermont with Temporary Bachelorette Woman and her trusty sidekick. So I didn’t think much about my birthday until today, when I received the most incredible hand-made birthday card in the mail. Our friend Lou W (a sweet lady who, along with her husband Larry have hosted us several times at their home in Ohio) makes cards for every occasion. 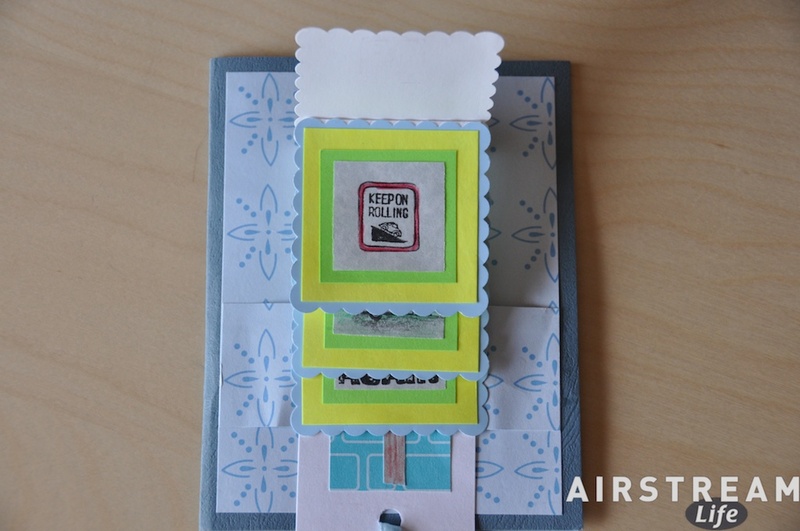 She has an incredible home office which is stuffed with every sort of rubber stamp, paper, ribbon, glue, lace, stencil, and paper punch that you can imagine. All of this is neatly organized for efficient card-making whenever the occasion should arise. Emma, being a “crafty” sort of kid, likes to go down into the basement office and make things under Lou’s direction. … encouragement? Recognition? Perhaps both! 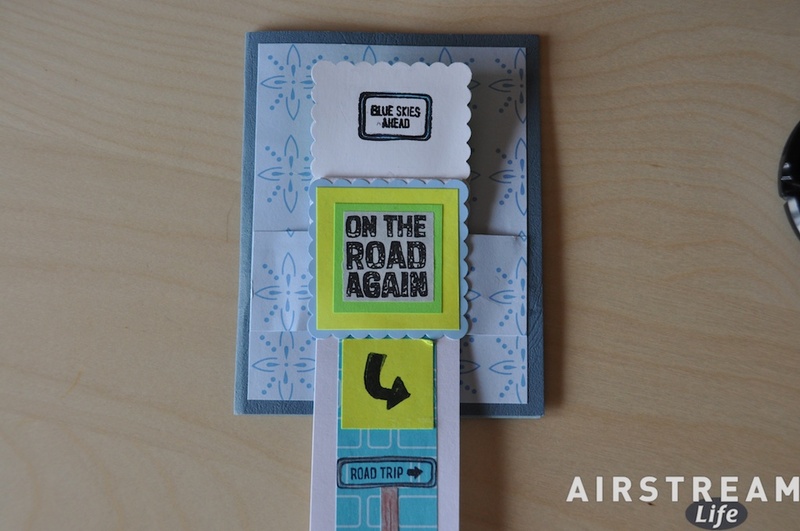 And the arrow directs you to continue the Road Trip by opening the card at last. Inside, signatures of Lou & Larry, their daughter Loren and soon-to-be son-in-law Mike, and some surprise bonuses! I had directed our friends Bert & Janie Gildart to Lou & Larry’s home for the finest courtesy parking in Ohio, and they arrived to find “Artist@Large” Michael Depraida courtesy parking as well. You can see their signatures as well. All are wonderful friends we made while traveling in our Airstream. We’ll see you all soon. I know we’re going to intersect with the Gildarts in late September, in Virginia, and we’ll see Michael at the next Alumapalooza if we don’t run into him earlier while out west this winter. 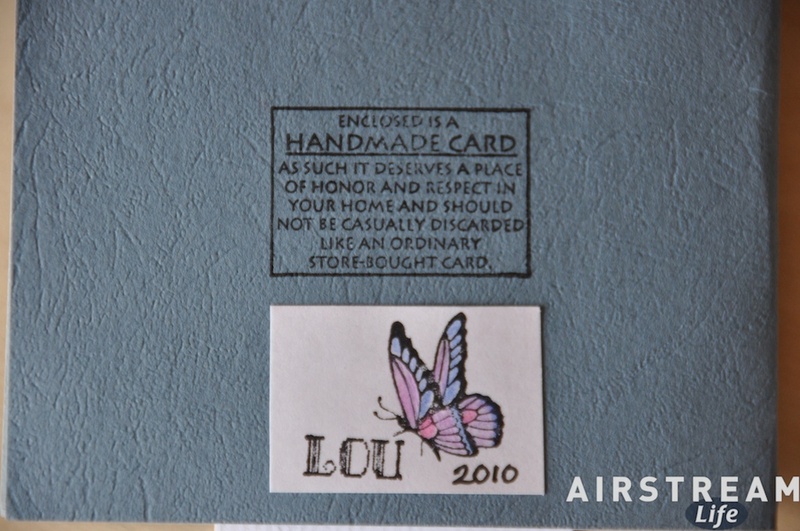 Finally, on the very back, Lou’s personal stamp and a bit of advice. Lou, you didn’t have to tell me! This one’s a keeper. 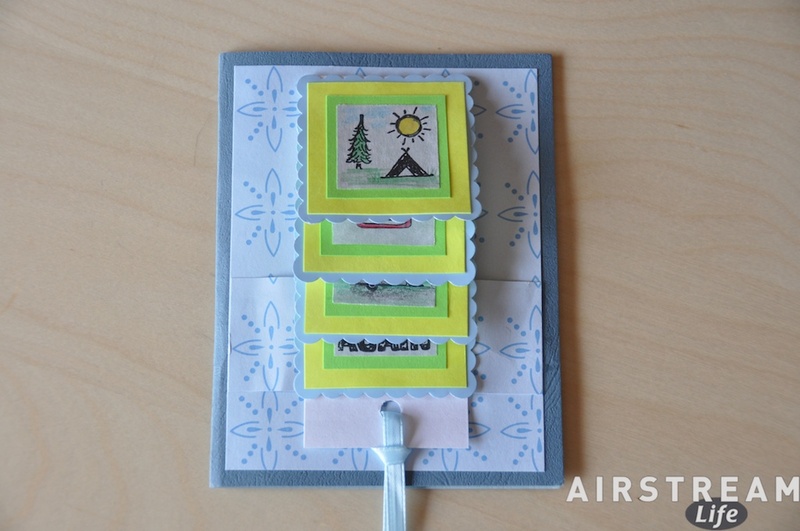 Thanks to you, and everyone else, for a really special birthday card. Now it feels like my birthday. Everyone has got to have a hobby, right? Well, most of the Airstreamers I know have several. It seems to be part of the Airstream owner psychological profile to be interested in lots of things. Perhaps it comes from our deep-seated need to explore. My friend Fred Coldwell is a prime example. In addition to being the foremost authority on historical Airstreams (and hence a frequent contributor to Airstream Life magazine), he is also very well-versed in the history of WW II Jeeps and “agrijeeps”, and lately, Pendleton blankets. 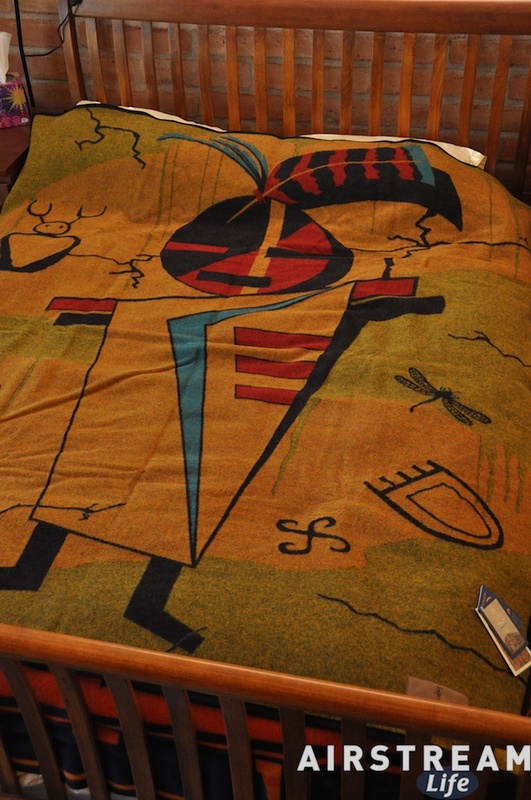 He’s written two articles for Airstream Life about the history of Pendleton’s long-running “National Park” blankets, and he also has a website on the subject, for collectors. Fred claims that Airstreams and National Park blankets naturally go together. 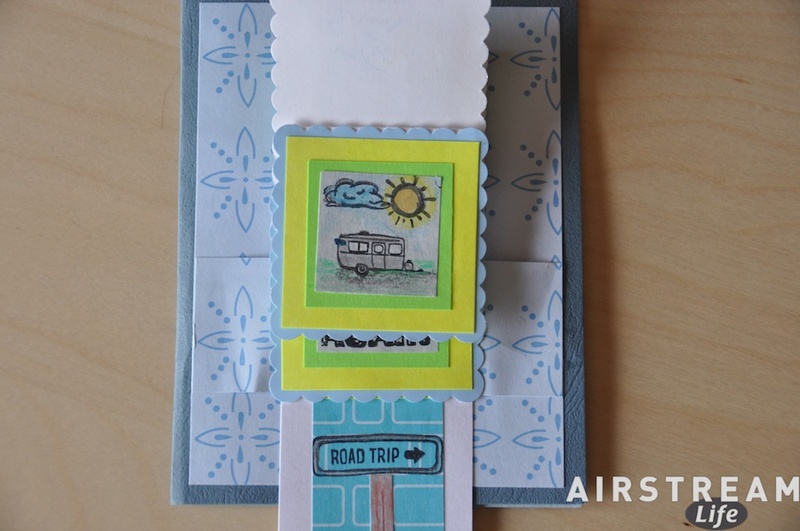 In his first article he suggested that it would a most sublime experience to visit some of the parks in their 100th anniversary years, and then go to sleep in your Airstream beneath a warm woolly blanket from one of those very parks. Visiting Fred’s house, I’ve always been struck by the incredible collection of vintage national parks blankets he has. His bed is literally buried in them, so many that I wonder how he is able to get in bed at night. He has chests full of them, each with a very specific historical significance that he can explain. 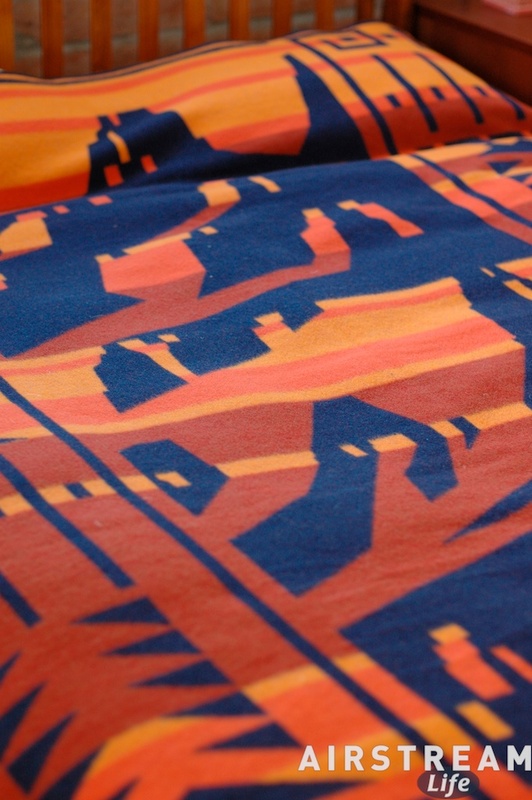 The stripes and designs of each blanket have meaning, and many of them are limited editions or historical versions that are no longer produced. It seems almost as if there as many variations to collect as there are with Hummel figurines. Fred has been single-handedly responsible for my interest in the Pendletons, too. Not long after he wrote his first article, Eleanor and I spotted a limited edition Grand Canyon blanket at the North Rim, and we bought it as an anniversary present to ourselves. A few months later, I bought another one on eBay, “Homage To Spider Woman.” (No, not Spiderman’s girlfriend, but a person from Native American lore.) That one was featured in a fine art post card by Facerock Productions (no longer pictured on their website) and came to me with some red dust still in it from the photo shoot. The Spider Woman blanket was used on our couch for the winter, and has since gone into the Caravel. The Grand Canyon blanket covered our bed in the house until this summer when I bought three more Pendletons in a bit of a blow-out sale. A guy had gotten these using coupons he’d won at an Indian casino, and was selling them on eBay for cash. Fred, again, was the motivating factor. He emailed me to say, “You’ve got to have this one!” and looking at the Man In The Maze pattern, I decided he was right. When the buyer came over, he offered me a deal I couldn’t refuse on “The Record Keeper” (pictured at left), so now we have a total of four Pendletons. One for each Airstream, one for Emma’s bed, one for our bed. I plan to rotate them around, since I love all of the designs. Pendleton makes the collecting habit even more addictive by creating limited-production versions for special groups. For example, the special Grand Canyon blanket we bought could only be purchased at the North or South Rim stores, and only for a year or so. It wasn’t even advertised. You had to go there in order to get one. 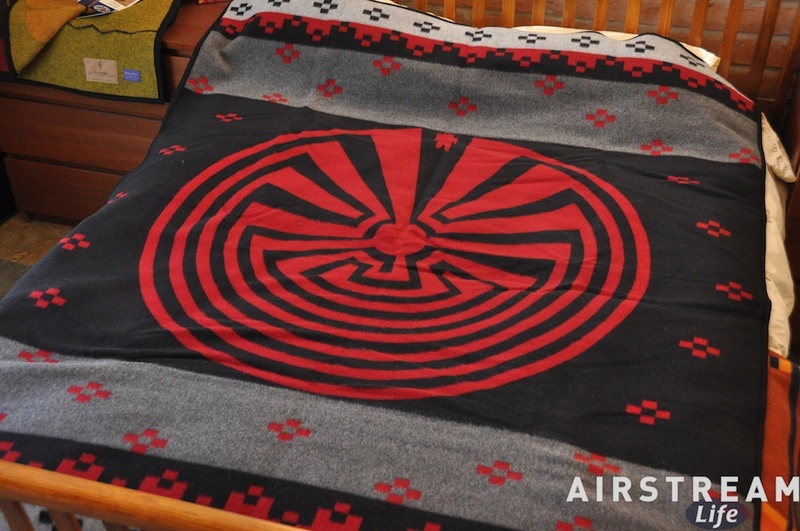 The “Man In The Maze” blanket is only sold by the Tohono O’odham community in Arizona. My Spider Woman blanket is also no longer available. There are zillions of really cool designs that you simply can’t buy today, unless you can find one used. This ensures scarcity of certain designs, and drives collectors into a frenzy to get “rare” blankets. But the only really bad thing about collecting these Pendletons is that they are expensive. Typical retail is $200+, although I’ve managed some bargains. They last forever, with appropriate care, and can become heirlooms, but there’s no doubt that collecting blankets is not cheap. And that brings me to the key point of today’s blog. Pendleton Woolen Mills is running a video contest in which you can win a full set of National Park blankets. Their “Celebrate the National Parks” contest runs through November 1, 2010. To enter, make a short video of why you love our National Parks or describing your favorite National Park, and post it on YouTube. (Details here.) If your video has the most views by November 1, 2010, you win. So, if you are heading out to any national park this summer or fall, take the video camera and maybe you can win the entire set! 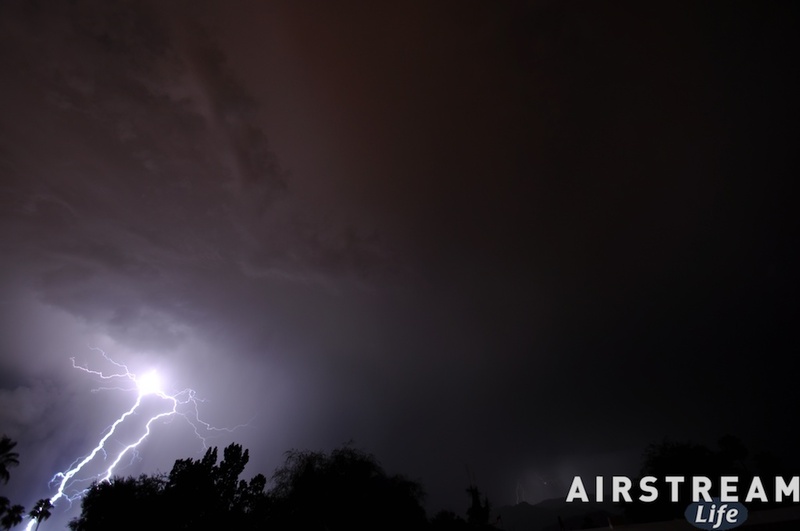 On Sunday night I was out photographing neon again, when an enormous set of thunderstorms rumbled through over the Rincon and Santa Catalina mountains. I grabbed my last picture (Mama Louisa’s Italian Restaurant on Craycroft), and headed home to get some photos. I’ve been waiting all summer for a really good lightning storm to show up. The year-round residents promised me a light show like I’ve never seen before, if I would only stay through the monsoon season. This year has been a bit of a bust so far, but Sunday night made up for it. There were hundreds of lightning strikes visible from our neighborhood in a couple of hours. I’ve never photographed lightning before, so I played around a little and shot several hundred images. (About 80 of them can be viewed on my Flickr site.) Conditions were perfect where I was standing: no rain, no wind, and a clear sky with great views to the storms. My technique was fairly simple. To maximize my chances of catching a lightning bolt, I used the super-wide angle lens (Tamron 10-24 mm) set to 10 mm. This allowed me to capture a large swath of sky. I mounted the camera on the tripod, set the ISO to 100, and manually fixed the focus at infinity. Rather than choose a pre-set exposure, I let the camera choose but I dialed in three to four stops of underexposure to make the lightning bolts show up. I have no idea if this is similar to the technique used by professionals, since I just made it up, but it worked well. The real trick of lightning photos seems to be patience. It’s basically a matter of aiming the tripod where you think the bolts are most prevalent, and pushing the shutter over and over again. If the storm cooperates, you can frame up a nice image in advance, using foreground objects to set the scene. But storms don’t cooperate with anyone, so you have to stick with it until that lucky confluence of preparation and timing occurs. My exposures ran about 5 seconds. If there was a strike in that time, I’d get it. But most of the time the lightning was obscured by clouds, which resulted in a well-lit sky but not a visible bolt. If you try this, get ready to hit that Delete key a lot later. Most of the shots I took were duds. Don’t pause to edit on the camera — just keep shooting. 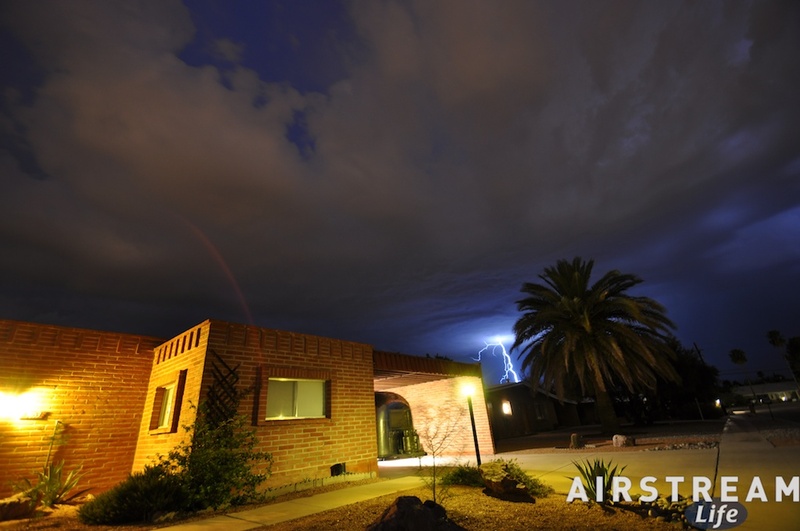 If you stop to delete photos from the camera, you’ll miss that great lightning burst, guaranteed. This means a big memory card is also an asset, to store hundreds of photos. This is the sort of storm that Eleanor and I were watching a few weeks ago when we were tent camping up in the Apache-Sitgreaves National Forest. We were fortunate that storm never reached us. 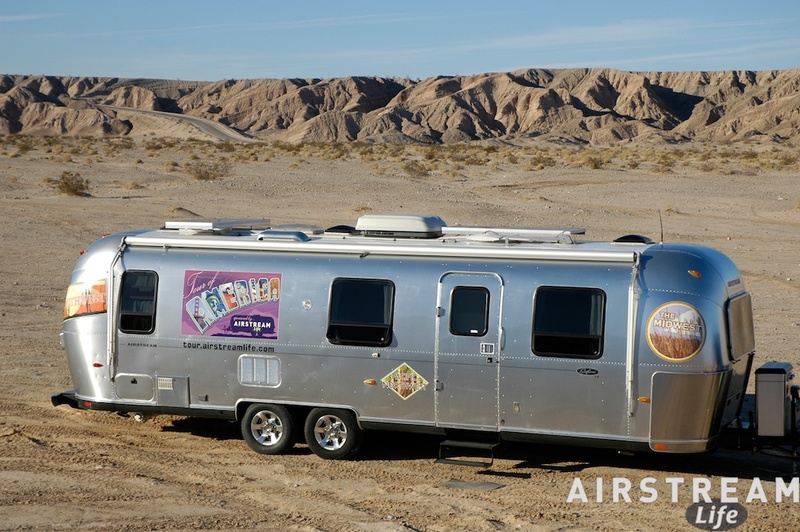 (We would have been much safer in the Airstream, thanks to the protective aluminum shell and the “skin effect“.) Watching the fury of these summer lightning bolts on Sunday, I was grateful that I was safely near home, and not in a tent. 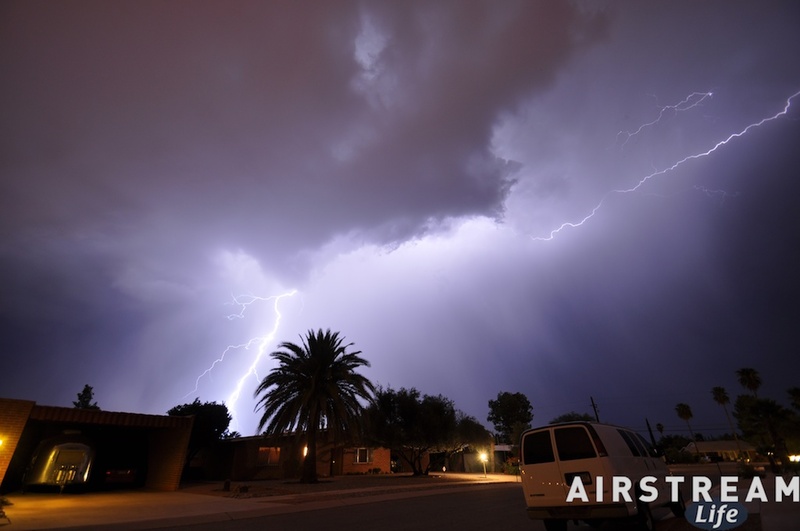 The monsoon may have been mild for Tucson most of this summer, but one night like this demonstrates just how fierce it can be — and what fun it can be if you happen to be standing in the right spot for a view.